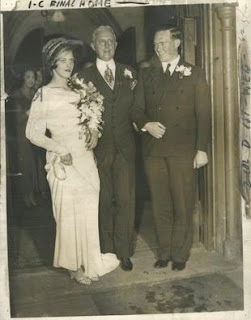 There he is that “gallus old codger” (thank you, Damon Runyon), front and center at his daughter’s wedding, circa 1934. Shortly before his death, Edward West “Daddy” Browning made a fool of himself one last time as he escorted Dorothy “Sunshine” Browning out of the church doors with her new husband Clarence Hood, a laundry operator from Dunn, NC. A few months later they stood around his deathbed in a gigantic rented mansion in Scarsdale, NY as poor Daddy passed on to his eternal reward at only 60 years of age. At least Dorothy obviously waited a bit to wed; her step-mom, the infamous Peaches Browning was all of 15 years old when she tied the knot with the old gas bag, himself a mere 52 winters gone by. 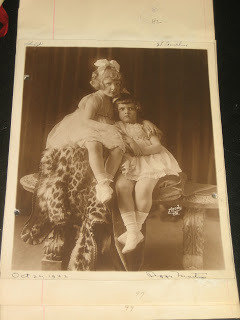 Dorothy was 10 when her new mom showed up, her sister Marjorie all of 12. Here are the sisters, in a photo from Daddy’s divorce case file in his first marriage to Adele Lowen. She was 23, he already 41 in 1915 when they wed. It lasted 8 years, but the couple had no biological children of their own. 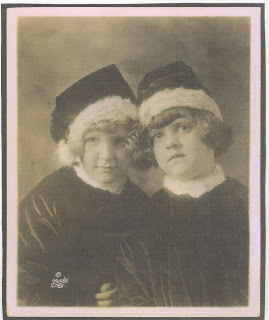 Each adopted a daughter, separately, with Daddy Browning taking sole custody of little Dorothy (right, brunette) and Adele taking Marjorie (left, blonde). What about that shir-eating grin on groom Clarence Hood’s face? He probably thought his new wife would inherit a bundle when her old man croaked. Clarence was in for a big surprise, though. Daddy Browning left his fortune to a newly created foundation that imitated the Nobel Prizes, and years of litigation followed before Dorothy was able to milk some dough for herself.